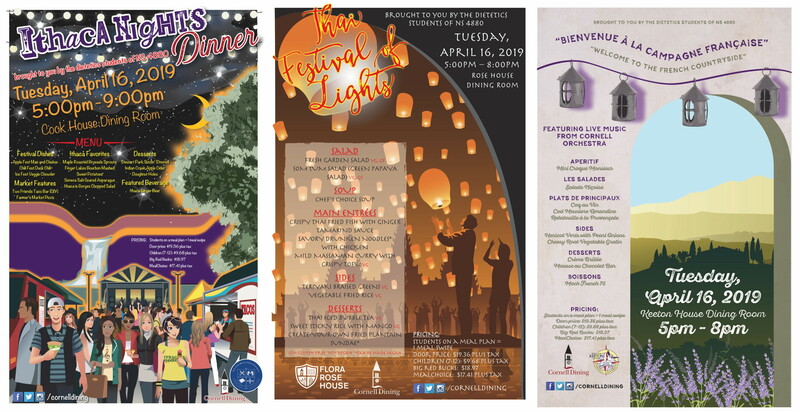 Enjoy cuisine from the French Countryside, a Thai Festival of Lights, or an Ithaca Nights dinner as the Division of Nutritional Sciences Dietetic Students of NS4880 team up with Cornell Dining to host their annual themed dinners. All are welcome! Enjoy a Mini Croque Monsieur, Salade Niçoise, Coq au Vin, Cod Meuniere Amandine, Ratatouille à la Provençale, Haricots Verts, Crème Brûlée, and lots more! Try the Som Tum (Green Papaya) Salad, Crispy Thai Fried Fish with Ginger Tamarind Sauce, Savory Drunken Noodles with Chicken, Massaman Curry with Crispy Tofu, Teriyaki Braised Greens, Thai Iced Bubble Tea, and more, with vegan and gluten-free options. Local favorite festival dishes such as Mac & Cheese, Duck Chili, and Veggie Chowder. Ithaca icons like Maple Roasted Brussels Sprouts, Finger Lakes Bourbon Mashed Sweet Potatoes, and Seneca Salt Seared Asparagus. Two Friends Taco Bar, Farmer's Market Pizza, Stewart Park Sizzlin' S'Mores, Indian Creek Apple Cider, and so on. Students on Meal Plan: 1 Meal Swipe, Door Price $19.36 (tax included), Children $9.68 (tax included), BRBs $18.97, Meal Choice $17.41 (tax included).